To cut to the chase on Somnath Bharti's "innocence until proven guilty"
Does AAP remember Khirki Extension? It's weired how arguments of morality and justice completely change when the focus is shifted to the AAP Gods. It's all per their convenience. Responsibility, corruption, propriety, expenses - whatever logic can Kejriwal can pull out of his "aam-aadmi" hat. What he doesn't realize is that the public stopped taking them seriously a long time ago, now they're just a sideshow act, which is going to run for 5 years. Even the entertainment appeal can't last that long. 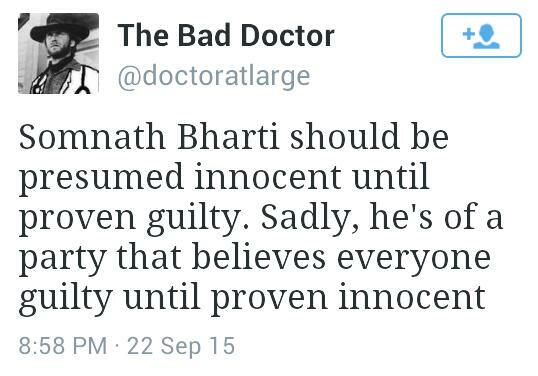 Indian Exponent: To cut to the chase on Somnath Bharti's "innocence until proven guilty"